Napkin rings Oval, set of 4 (7x5,2 cm) sp./lacq. Napkin rings Twist, set of 4 6,5cm sp. Napkin clips with chain 59,5cm sp. Set of 4 beatifully designed napkin rings with a twist. The napkin rings are silver-plated and lacquered, and therefore require no polishing. Silver-plated napkin clips on a chain, total length 65 cm The napkin clips are silver-plated and lacquered, and therefore require no polishing. 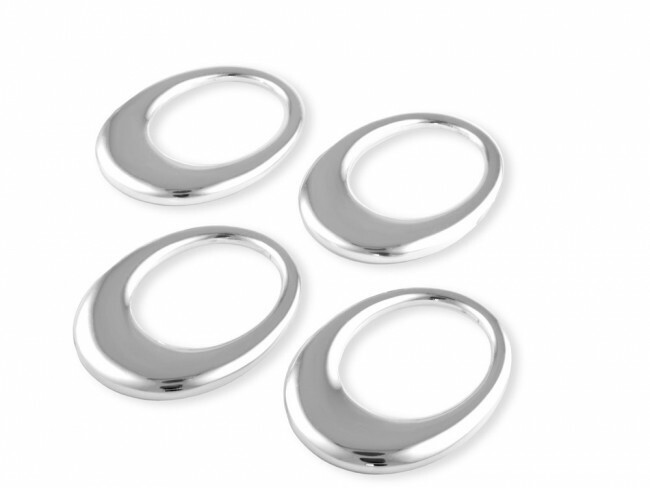 Set of 4 elegant oval-shaped napkin rings. The napkin rings are silver-plated and lacquered, and therefore require no polishing. You're reviewing: Napkin rings Oval, set of 4 (7x5,2 cm) sp./lacq.